PRESS RELEASE – Belmopan, Belize; November 15 – On Wednesday November 14, the Caribbean Community Climate Change Centre (CCCCC) began its handover of data collection devices purchased with funding from the USAID Climate Change Adaptation Program (USAID CCAP) to nine countries in the eastern Caribbean. Executive Director Dr. Kenrick Leslie and officials from USAID Eastern and Southern Office (USAID ESO) handed over the first of the 50 Automatic Weather Stations (AWS) and the 5 Coral Reef Early Warning System (CREWS) to the government St Vincent and the Grenadines at a ceremony held at the Argyle International Airport. Under the project, one AWS and one CREWS station were installed in SVG. 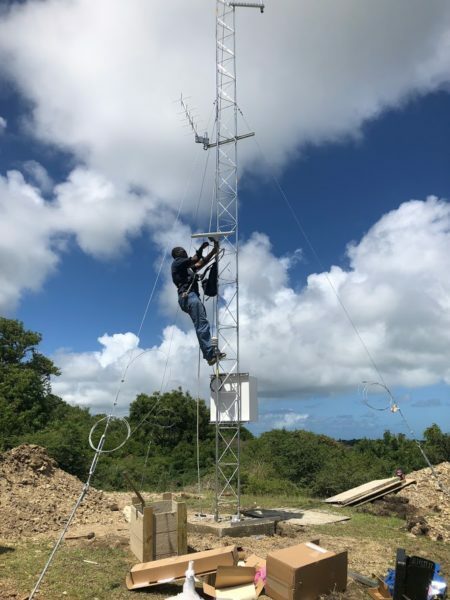 St. Lucia and Grenada also received one each AWS and CREWS station; two AWS and one CREWS were installed in St Kitts, while four AWS and one CREWS station were installed in Antigua. Other beneficiaries are Guyana with 21 AWS, Suriname with 16 and the CIMH in Barbados with three. These data collection devices are to enhance the region’s ability to monitor Marine and Terrestrial Environmental parameters to provide more reliable climate and climate change data. More than US$3 million dollars were spent under USAID CCAP to enhance the region’s data collection capabilities as the Centre and its partners seek to build the Caribbean’s resilience to climate variability and change. The marine and land-based data gathering systems were installed with assistance from the Caribbean Institute for Meteorology and Hydrology (CIMH), the National Oceanic and Atmospheric Administration (NOAA) and the governments of recipient countries. The CIMH has responsibility for maintenance under an agreement with the Centre. The new CREWS data buoys provide Caribbean scientists and researchers with marine data that allow them to monitor reef health, sea temperature changes, winds (speed and gusts), barometric pressure, precipitation, photo-synthetically active/available radiation (PAR, light), air temperature, and salinity. Other instruments may be added through arrangement with the host countries. The AWS’ collection of critical data to support climate services and climate change modelling in the region by improving the monitoring and collection of environmental variables including temperature, relative humidity, solar radiation, atmospheric pressure and rainfall. The systems are critical tools for building resilience, providing data to support climate and climate change science and information to aid decision makers. USAID CCAP supports activities that are critical for the successful implementation of climate change adaptation strategies across the Caribbean. By caribbeanclimate in News on November 15, 2018 .